As a general in the Republic Army, Obi-Wan Kenobi leads Clone Army warriors and ARC Troopers in ground battles throughout the galaxy. 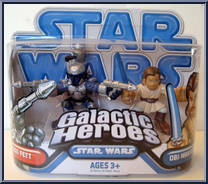 Coming up against the formidable Droid Army, Obi-Wan achieves hard. . . Although young and headstrong, Jedi apprentice Obi-Wan Kenobi will become one of the greatest Jedi to ever protect the galaxy. As the invasion of Naboo rages outside, Jedi apprentice Obi-Wan Kenobi battles the evil Sith Lord, Darth Maul, in a fierce lightsaber duel. The outcome could change the galaxy forever! 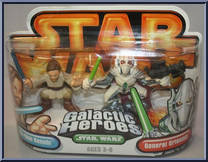 The young Jedi Knight Obi-Wan Kenobi and his mentor, Jedi Master Qui-Gon Jinn, help Queen Amidala and her forces in their attempt to liberate the planet Naboo from the overwhelming onslaught of the Tr. . . Many settlers on Tatooine regard old Ben Kenobi as a crazy wizard. 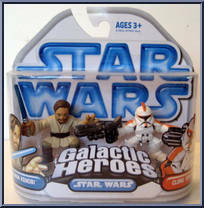 In fact, he is General Obi-Wan Kenobi, a veteran of the Clone Wars, and one of the last surviving Jedi Knights. For years, he lived a. . .
A Jedi must always be well equipped for any circumstance. 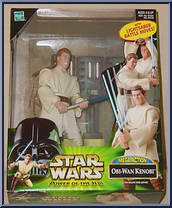 Obi-Wan Kenobi, a loyal and disciplined Jedi, is often sent by the Jedi Council to resolve matters on worlds where the environment is very col. . .
Obi-Wan Kenobi, a Jedi Knight training under Jedi Master Qui-Gin Jinn, has proved his loyalty to the Council and Jedi code time and time again. In missions involving great danger, the Jedi don special. 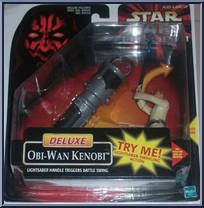 . .
A young Jedi strong in the Force, Obi-Wan Kenobi is an expert in the art of hand to hand combat. 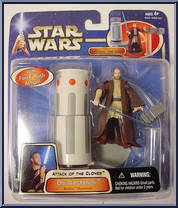 With seemingly effortless grace and power, Obi-Wan cuts down several battle droids with the burning bla. 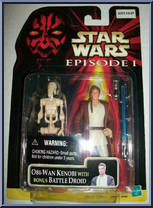 . .
Obi-Wan is headstrong and impulsive, but he is also loyal and trustworthy. Despite the objections of the Jedi Council, Obi-Wan has vowed to fulfill his Master's dying wish: to train Anakin Skywalker t. . . Cautious and disciplined, Obi-Wan Kenobi has matured into an accomplished Jedi Knight. Bearded and garbed in a traditional Jedi robe, Obi-Wan now serves as Anakin Skywalker's Jedi mentor. On the storm. . .
Free of the binders that bound him to a column in the Geonosian arena, Obi-Wan Kenobi defends himself against the ferocious beasts that have been let loose in the arena to attack him, Anakin and Padme. . . Ten years after losing his Master at the hands of the Sith, Obi-Wan Kenobi has become Anakin Skywalker's Jedi Mentor. Given the mission to protect Senator Amidala after an assassination attempt on her. 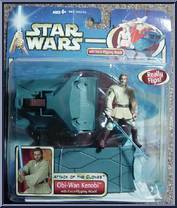 . .
Obi-Wan Kenobi is sent to Kamino by the Jedi Council to discover who is behind an assassination attempt. Piloting the Jedi Starfighter, Obi-Wan discovers an industrial facility in which a stunning cul. . .
Obi-Wan Kenobi and Anakin Skywalker chase the assassin, who attempted to take the life of Senator Amidala, into the Outlander nightclub on Coruscant. As Obi-Wan bides his time, waiting for his quarry . . . 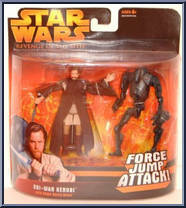 Using the force, Obi-Wan Kenobi flips into battle against the evil Sith Darth Tyranus. 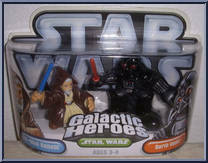 The courageous and disciplined Jedi Knight fights for his life as the master swordsman Darth Tyranus prepares to . . .